On a clear day in New York City, some time in the early 1930s, Merian C. Cooper was walking through Manhattan and happened to glance up at the Empire State (then the tallest building in the world) as a warplane passed overhead. At this moment, a novel image crystallized in his imagination: a giant gorilla atop the building, swatting biplanes from the sky. He couldn't have known in that instant just how many giant gorilla movies would spawn from this one epiphany. 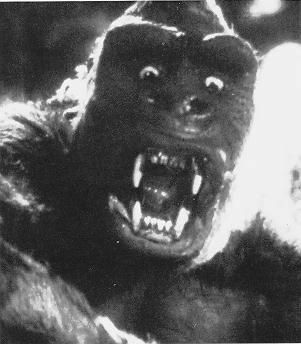 Cooper's 1933 King Kong was the classic that started it all, followed by Son of Kong (1933), Mighty Joe Young (1949), a string of Asian films in the 1960s and 70s including a Toho version of Kong as well as even more bizarre offerings like Konga (1961) and The Mighty Peking Man (1977), and more. These are only a few of the many, many films based on the concept of a gargantuan ape toppling trees and buildings and defying military might with his formidable monkey flesh. Oh, and there's usually a tiny blonde in there, trembling in the shadow of the monster's giant palm. What exactly is the appeal? One might say that a gorilla as a pop icon is a projection of hyper-masculinity––the rife body-hair, bulging muscles, etc. This would explain the unfortunate pervasiveness of the quivering damsel trope in so many of these films. However, I believe there's more to it than that. Merian C. Cooper got his inspiration from the memoirs of French zoologist Paul Du Chaillu, arguably the man who first brought knowledge of the gorilla out of Africa to Europe. One imagines what Du Chaillu's first encounter with these imposing beasts must have been like. 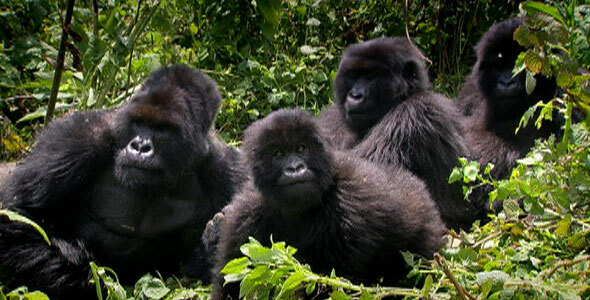 Gorillas share something like 98% of our DNA. If you'd never seen one before, you might well think you had happened upon some sort of half-man. And considering adult males weigh as much as 400 pounds, you might well be terrified. But gorillas aren't really as brutish as they're made to appear in pop culture. They're massive and dangerous, yes, but also gentle, family-oriented, and shy. Therein, I think, lies the rub. Gorillas look like hairy pro-wrestlers but they're more interested in munching on bamboo than they are in body-slamming something. To observe one is to experience a sort of potential energy for monster behavior. The giant gorilla movie, then, is the realization of that primal fantasy. The question is, if you flesh out that fantasy, does it make for good cinema? And if so, what's the trick to getting it right? The original 1933 Kong is an undeniable masterpiece, marred as it is through a modern lens by its hammy acting and sexism. It imbues Kong and his island with an abundance of mystery and finds the sweet spot between Kong's beastliness and anthropomorphism. And its ape-on-dinosaur mayhem is brilliantly choreographed for maximum visceral effect. I loved it when I was a kid. It was, for me, what the tales of Paul Du Chaillu were for Merian C. Cooper, Kong's creator. 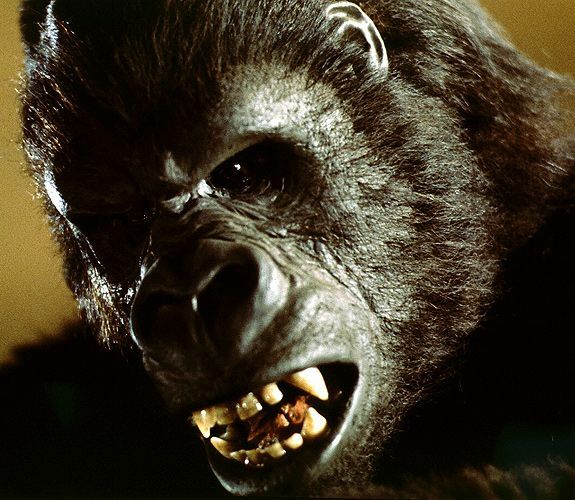 The 1976 Kong remake from Dino de Laurentiis is basically unwatchable. As in, I tried to watch it and just didn't make it. The human characters are unbelievably boring, except for the damsel in distress Dwan (that's right––Dwan) who is only interesting because she is so objectified by the script and the direction that she comes off as thoroughly bizarre. No human woman behaves like she's made to. And the action sequences are all just kind of meh. Peter Jackson's 2005 remake is a loving homage to the original, complete with action sequences that are beat-for-beat lifts from the 1933 version. I know some people who consider this film unwatchable as well, as it's 187 minutes long, Kong doesn't even appear in the first hour, and Jackson is pretty self-indulgent in all aspects of the production. But you can't deny the breadth of its scope, nor the depth of its themes. It contains Heart of Darkness references, clever homages to the original, a foil for Kong manifest in a writer living in a cage, a plausible geological explanation behind its island gigantism, and a masterful mirrored shot in which Kong is symbolically sacrificed to western civilization while an actress is faux-sacrificed to him. Jackson's Kong revels almost too much in its own mystery and majesty. It's an overlong, sprawling masterpiece and I love it dearly. Which brings us to 2017. Legendary pictures have rebooted the Kong franchise as part of their cinematic Monsterverse which means that Kong now inhabits the same world as Gareth Edwards' 2014 Godzilla and will face off against said giant lizard in 2020. Speaking of Edwards' film, it takes a similar approach to Jackson's Kong in that it's a very slow burn and takes a while to show its monster, but it works because it attempts to make every shot of Godzilla meaningful by showing him exclusively from the POV of the tiny humans struggling to stay out of his way. The human story of that film is pretty boring, but when Godzilla is even partly on camera, he captures one's sense of wonder firmly in his reptilian grip. Apparently, Legendary heard fans didn't like the less-is-more approach and have done a complete 180 with Kong: Skull Island. 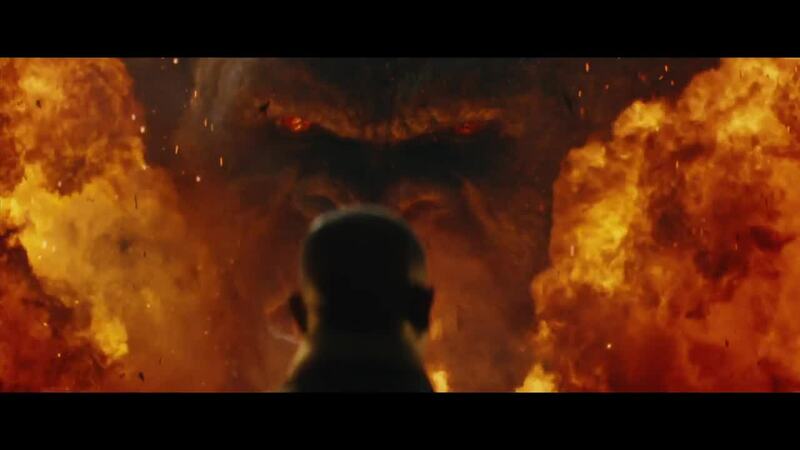 In this year's update of Kong, the eponymous gorilla is revealed in the film's first five minutes, and the pace of the movie is fleet and brisk. Action sequences are plentiful nigh unto gratuitous. I might go so far as to say the film abandons any sense of mystery, but what it lacks in suspense it makes up for in unabashedly over-the-top monster mayhem. This is the John Woo MI:2 of the Kong franchise. It also features the tallest Kong ever put onscreen (if you don't count the Japanese version of the character in his old Godzilla face-offs). This is a Kong who uses trees like baseball bats and ship anchors like brass knuckles. In several shots he's portrayed as a hulking silhouette against an impossibly huge, glowering sunset. In others, his eyes smoulder through the blooming fires of exploding helicopters. Good ole Samuel L. Jackson (who I can't really take seriously anymore) is often shown glaring defiantly at Kong when he really ought to be trying not to get squished by huge monkey feet or falling helicopter debris. And don't get me started on the ridiculousness of a certain character's gas mask/katana spree. I don't mean to knock it; it's a fun movie. I was just a bit surprised by the cheese factor. There are quite a few human characters and not enough of them have arcs, but the 1970s setting is refreshing and the performances are good. John C. Reilly, in particular, is a big highlight. A lot of people will enjoy this movie as action-packed, low-maintenance escapism. But I'm honestly not here to talk about the film per se so much as its portrayal of Kong as a pop culture icon. And there are a couple interesting things about his depiction here. Firstly, his look is a big step away from Peter Jackson's overgrown silverback and a big step in the direction of his classic monster roots. He's bipedal. His eyes are buggy. His sagittal crest is reduced and his brow exaggerated. The director Jordan Vogt-Roberts has said, "We worked really hard to take some of the elements of the ’33 version, some of those exaggerated features, some of those cartoonish and iconic qualities, and then make them their own." The second thing that interests me is his relationship to humans. 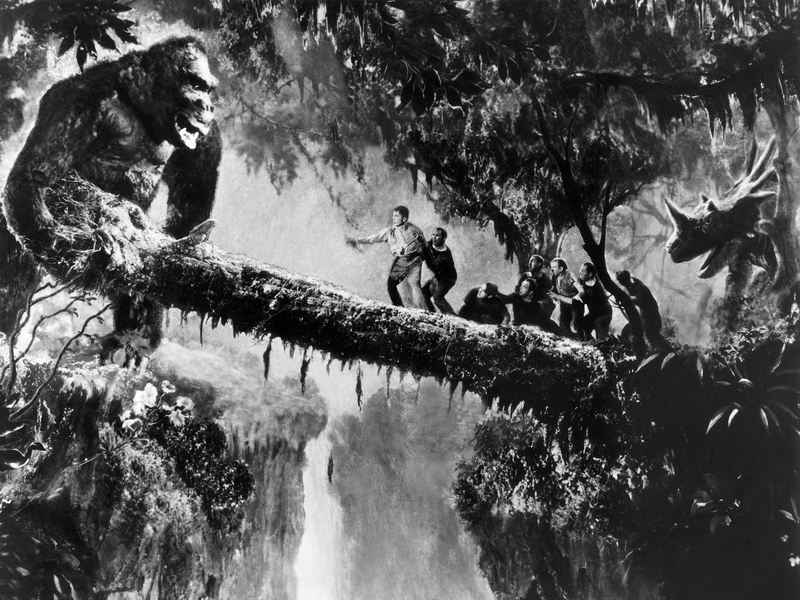 In previous versions, Kong was separated from the tiny, hairless apes on his island by an ancient, impenetrable wall. He was placated with sacrifices and, once through the wall, happily stomped and munched on anyone in his path. In this film, he's less of a monster and more of a benevolent god to the natives and has no interest in devouring maidens or smashing villages. His one goal in life is to keep the subterranean skull-crawlers subdued and as long as he's keeping up on his goal, he's happy. "Keeps to himself mostly," says John C. Reilly's character. 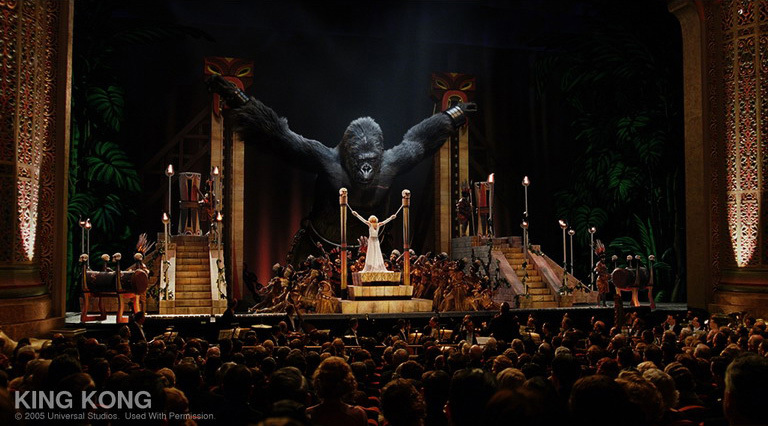 Thirdly, Kong is poised for interaction with other monsters in Legendary's new Monsterverse. The tone of Kong: Skull Island is so different from that of Godzilla that it will be fascinating to see how they combine in 2020. 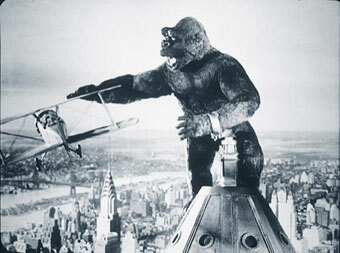 In this film, Kong stands 104 ft. tall but is reportedly only an adolescent and will have grown substantially by the time he meets the radioactive lizard in a modern setting. That's good because Gareth Edwards' Godzilla stands at 350 ft. and it wouldn't be much of a contest if the current stats remained unchanged. And, last of all, let's all be happy that Kong no longer comes with a half-dressed supermodel to tote around. Peter Jackson did his best to make Ann Darrow more of a volitional character and less of a prop, but in Skull Island the closest thing we get to the damsel in distress is Brie Larson's character who needs saving for about thirty seconds tops, doesn't really scream if I recall, and also gets to shoot guns and stuff. I, for one, am happy that we can kiss that aspect of the Kong icon goodbye. Kong: Skull Island earned a 78% on Rotten Tomatoes and it did that without needing a damsel in distress. And so the giant ape continues to evolve.